Track your e-store’s activity straight from Magento! Magento makes it possible to conduct a routine analysis of your sales, clients, and products. However, the data is presented in the form of graphs that cannot be modified and that can be difficult to interpret. The Ultimate Reports extension is an interface that allows you to navigate through your sales statistics quickly and easily. It gives you complete control to manipulate your data so that you can track your sales turnover and its relationship to a given product or brand. You can also filter your results for a specific window of time (days, months, years) and view your daily, monthly, or yearly sales within a customized time frame. All graphs can be configured to a specific time period and saved in a PNG, JPG, or PDF format. Ultimate Reports is fully integrated to your back office and gives you access to over 30 different sales report options. This versatile tool helps you to assess your market, to drive sales, and to make decisions that will enhance the future growth for your business. Ultimate Reports is fully compatible with Magento. 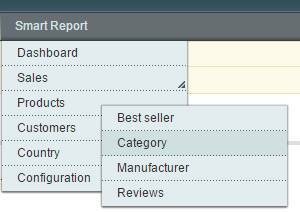 The reports are available in a dedicated menu, as well as in Magento’s product details. The dashboard gives you an instant overview of your business activity. Once an overview has been produced, Ultimate Reports offers several ways to conduct a more detailed analysis of your sales data. 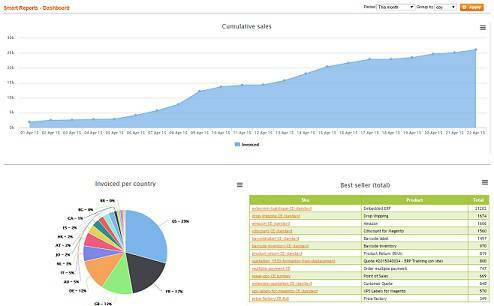 You will find the sales breakdown by country in the dashboard. Click on the country name for further details. You have a top-selling product for the month. Click on the product name for a detailed analysis of its sales trends. You have a top-purchasing customer for the month. Click on the customer’s name for a detailed account of their purchases. Ultimate Reports allows you to embed each product analysis you conduct directly into your product details page. Do you need to analyze the results for a specific product? With Ultimate Reports, you can easily find every statistic you need regarding your products. Observe your business performance up close and drive sales accordingly! Don’t get stuck with a pool of global data that you cannot interpret because you do not understand the underlying details. Ultimate Reports is an interactive tool that provides you with the big-picture data up front, and then allows you to customize your analysis in a few clicks! Your data can also be downloaded to an Excel spreadsheet for an even more detailed analysis.